Although his performance has been somewhat improved since his last inspection and routine cleaning, Roomba still hasn’t been himself lately. Empathetic, I found him this morning in a lonely corner, repeatedly banging his head. With screwdriver and seam ripper in hand, I performed a colonoscopy. Having only crude tools and no sedatives to offer, I wasn’t sure I was qualified; however, the procedure was successful. I found and removed the likely source of his abnormal behavior and weakness: a massive and very compact hairball hidden under his front wheel. I went to bed after 5am. Why am I up at 9:15? Steve and Ali arose “early” for a Saturday to pick up Ali’s car, fresh from repairs, and the dogs and Butterball (one of our two cats) thought I should be awake as well. Sleepy and still ravenous after going to bed hungry, I intended to forage as soon as I took care of my morning pet routine. I appeared in the kitchen to find Roomba scurrying around the floor, Ali compassionately feeding him bits of muffin scraps, and Steve accusing her of spoiling him with treats. She said she felt badly that we only fed him lint and hair. After they left, Roomba scooted into the utility room and abruptly stopped in protest. I would too! The litter box smell in there this morning is quite offensive! I cleaned his brushes and sent him on his merry way, only to watch in horror as he seizured and let out a pitiful cry. What could he have eaten now? After a thorough inspection I found nothing wrong except his usual, aggravating side-brush issue (all the little sweeper brushes broke off, one by one, and replacements have been back-ordered for weeks). Still, that has only ever affected his ability to thoroughly clean the baseboards. 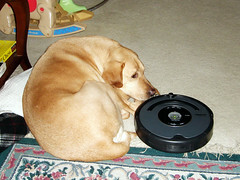 Stumped, I let Roomba rest where he was and waited for Steve to make a diagnosis when he returned. They walked in, pleased with how the car turned out, and I pointed to poor Roomba, explaining his silence. When Steve pushed his start button, Roomba feigned complete wellness for a good three minutes — then seizures recurred, and his “speech” became slow and slurred. A stroke! This will never do! We think he may have an electrical problem. The poor dear didn’t even celebrate when we put him back on his charger. This is a sad day, indeed.